← Showers/flurries possible early today across PEI..
Tuesday, October 23rd 8:00am.. A ridge of high pressure currently crossing the Maritimes will give sunshine to the island this afternoon then drift off to the east. This feature will give sunshine, light winds and pleasant temps to the island today. Clouds will begin to invade the region this evening ahead of the next weather system approaching from the west. An area of low in southern Quebec will redevelop off the New England coast near Cape Cod late this evening. This system will then intensify as it moves NE and is expected to track into southern NS late tomorrow afternoon then turn northward cross PEI Wednesday nigh into Thursday morning. 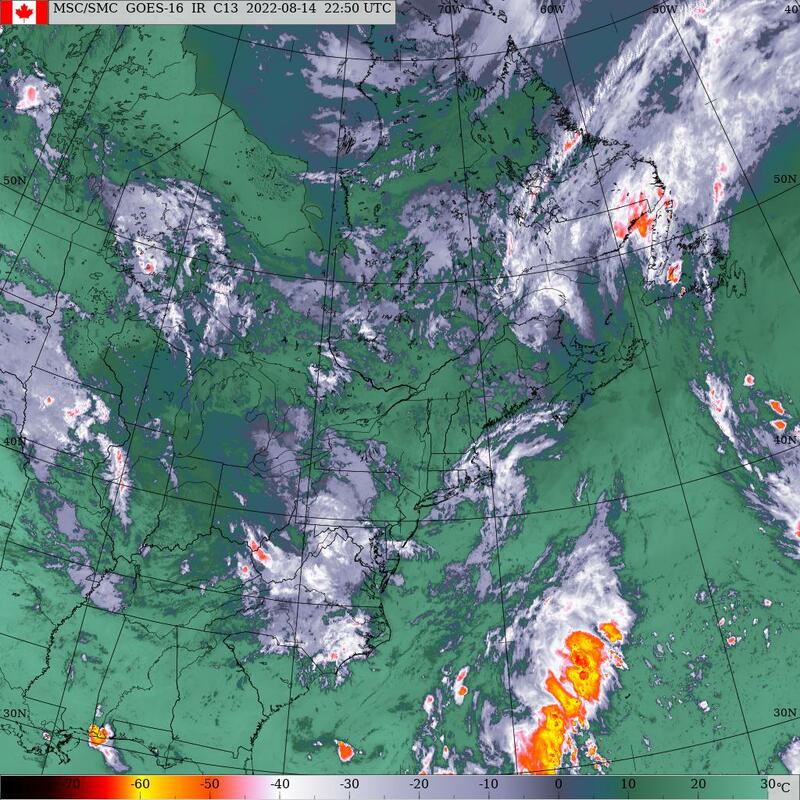 This system will bring a mixed bag of weather to snow across central and northwestern NB while significant rain is expected across eastern NB, NS and PEI. This system will be slow to move out of the Gulf of St Lawrence resulting in brisk W-NW for Thursday and Friday. Much cooler air will also invade the island in the wake of this system. Winds will calm down on Saturday as a ridge of high pressure crests over the island with sunshine early in the day. Clouds will once again be in the increase during the day as a low pressure system approaches from the south. This system is actually the remnants of Hurricane Willa which will strike the west coast of Mexico this morning. The remnants of Willa will cross Mexico then emerge into the Gulf of Mexico Thursday morning. The system will then turn NE developing off Cape Hatteras Saturday morning then track north and is expected to move inland across New England and eastern Quebec. The expected track of this system will of course change over the next few days but looks like another wet Sunday and Monday for the island. Precipitation.. Rain begins just after midnight tonight tapering to showers tomorrow afternoon with amounts of 10-20 mms possible. The higher amounts down east while lower amounts up west. Flurries for Thursday and Friday. Dry Saturday. Rain begins near midnight Saturday night and continues all day Sunday changing to flurries for Monday. Temperatures.. Slightly below normal today, slightly above normal tomorrow. Below normal Thursday through Saturday, warm-up begins on Sunday becoming above normal on Monday. Wind.. Light west winds now will shift to easterly late this afternoon becoming brisk and gusty by dawn tomorrow. These winds will then diminish and shift to southerly tomorrow afternoon then further shifting to westerly after midnight tomorrow night. Brisk westerlies then expected for Thursday and Friday. Hazards.. Wet driving conditions in rain beginning overnight tonight and continue tomorrow. Tonight.. Rain beginning after midnight, increasing east winds becoming brisk by dawn, Temps will drop to 3 near midnight then rise to 6 by dawn tomorrow.